Alcatel is no stranger when it comes to tablets, but they rarely venture into Windows 10 with something compelling. 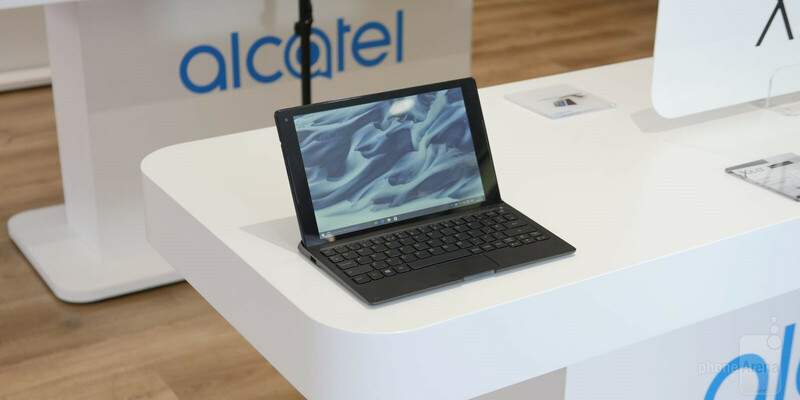 Well, that’s all changing with the introduction of the Alcatel Plus 10 – a 2-in-1 LTE connected device that aims to bring a productivity package for the budget cost you know that Alcatel is known for. It’s a new territory for them, so it’ll be interesting to see how its model is able to differentiate, and more importantly, captivate consumers over comparable devices. Visually, the 2-in-1 connected device is comprised out of a plastic shell. It’s not premium feeling, that’s for sure, but we do appreciate that it’s compact enough to make travel effortless. The keyboard feature chicklet-styled buttons that have decent travel, spaced evenly from one another, trackpad, its own battery that supplement’s the tablet’s own, and additional ports that are otherwise not available in competing keyboard docks/attachments. The package is quite versatile to tell you the truth, mainly because we like how it definitely would allow users to get some work done on the road – more so with the keyboard, which adds a layer of versatility here. However, the display isn’t quite as convincing, due to how it just looks sub-par in terms of its quality. While looking at it straight on poses no issues at all, it’s almost to miss its weak viewing angles, lack of detail, and general washed out appearance. To be fair, though, we’re dealing with a 10.1-inch 1280 x 800 IPS display here. Based on the specs, we can gather that the Alcatel Plus 10 won’t be the thing you’ll want to use for heavy processes. Its quad-core 1.92GHz Intel Atom Z8350 chipset with 2GB of RAM is an effective combo for basic things, even for some light video editing tasks, but it doesn’t possess the firepower to handle 4K video editing – nor is it a gamer’s choice either. Still, it serves its purpose in those basic things we sometimes take for granted. If we’re to guess, the Alcatel Plus 10 would be most attractive at sub-$500. It’s roughly the same caliber as Microsoft’s own Surface 3, but considering this is Alcatel, we’re really crossing our fingers to see it at a lower price point. At $500, it might still prove to be a tough battle for this Atom-driven 2-in-1 connected device, even if the keyboard is part of the cost, but at sub-$300, it’ll have a higher chance of garnering attention. Only time will tell! As it stands right now, it’s bound for the European market starting in June. No word yet on US availability though.